I like it- simple and precise. April 29, 2018 - 10:11 pm Jim S.
In windows 10 64 bit, I had to go here to make it work. I was getting rtl open error -12. Works great, thanks a lot for implementing it so we all can try HD radio without buying ridiculously priced hardware! I’ve used a version pre-compiled for Windows, works smoothly right out of the box. Sound quality is not impressive, FM sounds better to me, digital audio compression artifacts are pretty obvious, but that’s not surprising taking data rates into account. Very good as a source of information, not so good for listening music (not terrible, though). Some channels output text files (weather and traffic data), images (maps, album covers and radio stations logos). Very very cool! I am actually surprised this is even possible. The only unfortunate thing is that it is command line, so you can’t just surf around the dial for your favorite HD stations, but hopefully someone will take this code and turn it into something that will let that happen! Has anyone thought about integrating NRSC5 into SDR# (or similar)? Is a plugin mechanism available? Distributing a binary I think is a problem, whoever does so would be sued by mpegla for non payment of licensing fees for use of their patent portfolio which would cover the modified MPEG-4 HE-AAC codec used in NRSC5. And by iBiquity Digital Corporation for their patent portfolio. One option is to wait the ~20 years until the patents expire (which for HE-AAC should probably be about 7 or 8 years from now). HD meant Hybrid Digital when the system was being developed along with occasionally being referred to as High Definition. Then Ibiquity (the patent holder and licensing agent) proclaimed that HD was a trademark that stood for nothing. All previous interpretations were flushed down the memory hole. I almost have this working per your description above. When I copied and pasted the Step 2 batch file contents, I had to retype the single and double quotes because copying from the web page and pasting into the .bat file did not provide the correct characters. I’m getting the files extracted from the data so and I can open the audio.adts file in VLC so my next step is to install ffmpeg to merge the pics and audio stream together and open the radio.ts in VLC. Thanks so much for providing the above info! This is what ended up working for me. I put all of the nrsc5 files in a new folder c:\HDRadio. Created a new folder c:\VLC (Even though I have VLC installed in program files folder) Created c:\vlc\1\image.jpg empty file. I had to put two “-” before dump-aas-files. Installed ffmpeg. The files I uploaded below were actually compiled using the instructions from https://github.com/theori-io/nrsc5 and did not work properly for me. I had to use the files that Zoot Suit uploaded to http://www.mediafire.com/file/mnd31yr5mqwlmbe/nrsc5.zip. I’m running Win 7 64 bit on Intel i5 2400S. Don’t forget, if you copy paste from here to manually replace ” and ‘ by deleting and retyping. Windows-compiled binary, 32-bit flavor. Should work on a lot of windows machines. Hope this helps y’all. It didn’t work before but now it does. I was getting some kind of key regeneration error from Mediafire. This is the first time I successfully compiled a program under Windows. I achieved similar results compared to Zoot Suit but with different dlls. Not sure why, but after spending an hour and a half installing and compiling stuff that I had no interest in, I wanted to share my results in case the file Zoot Suit linked was not working for someone else. It worked for me with the following command line but only after reinstalling zadig drivers again, even though my RTL-SDR was working under SDR# and HDSDR beforehand. I figured it would be an easy way to share tips, scripts, reception reports, and provide or get help. If you friended me on Facebook for the purpose of any of those things, that is the place to go. Has anyone else tried no decode DX’ing just attempting long distance block detection? I let my sdr run the night before and was able to detect a few blocks with an indoor telescopic dipole of a station at 60 miles away as the crow flies. I can copy the station fine in analog with some static and a custom filter. I would love to play with it during a tropospheric ducting event. I was just curious if anyone else has tried this. Can you explain how this “no decode DX’ing” is done? As far as I can tell, nrsc5 provides only audio decode, not data (RDS?) recovery. So I tuned to a station that I can barely get in analog. I parked nrsc5 on that station over night and was able to get a couple of these: First block @ 6 It’s a similar concept to trying to DX with HD lock lights on radios. If you get a block, a sync, or better yet a demodulation of the audio even for a second of a distant station you’re doing it. I was able to lock this morning at 60+ miles with an indoor antenna with no amplifier. unable to find program, or corrupted. Maybe someone who is more aware of the fine details can answer this curiosity for me: Given the modification to the AAC audio stream, how much effort would be needed to have it modified on the fly back to a standard bit stream that is compatible with regular AAC/HE-AAC decoders on the market? My thought, purely for research or personal purposes, is eventually being able to bit stream the audio to an Icecast server, no transcoding, and have it behave with standard AAC decoders. I had considered doing this, but it seemed like too much work. After your comment, I couldn’t resist though. The complexity comes from the fact that parsing an AAC packet is non-trivial, e.g. huffman tables, etc. I borrowed some code from FAAD2 to ease the pain. The code is in github (https://github.com/theori-io/nrsc5/blob/experimental/src/hdc_to_aac.c). I confirmed that I was able to stream it to a local icecast server and play it with VLC. Awesome. Glad to hear that made it in. Still need to play around with it some more and tweak my setup. Been trying to run it in a VM but the PPM is fluctuating wildly all over the place and won’t sync up. So going to try and move it over to a Pi 3 and see how that fares. Has anyone gotten this to compile under Cygwin x86_64 ? I’m running into many unresolved symbols during the linking phase, such as R_X86_64_PC32. Can provide complete error info if someone would like to take a look. For those interested, the repository (https://github.com/theori-io/nrsc5) now has an experimental branch. The experimental branch should handle gain and ppm options for you, so you should no longer need to provide those. Okay, that is slick! I’m not fighting with ppms and guessing on gain anymore, and most everything is coming in from my town. Thanks! I’ll have to keep an eye on this as things improve. Wish I knew some code so I could help out.. The experimental branch is working great on x86. Lower CPU usage and I’m now able to pull just about all the local stations. I was also able to build the experimental branch on ARM and I’m also seeing substantially low CPU usage there but I am still unable to over the air decode with the exact same sdr setup for some reason. It’s incredible work and the new ARM code paves the way for some exciting projects. I would love the help! I had that error, too. If I recall correctly, I fixed it by installing the librtlsdr-dev package. Yes! This was just (presuming you have a Ubuntu/Debian variant) making sure all of the -dev packages were loaded, like librtlsdr-dev. I had the same thing happen, but I had to install autoconf as well. My problem now is that is says “nrsc5: command not found”. Sorry if my comment is a duplicate as my previous comment in response to this has disappeared on my side. If your current directory is your build folder, try src/nrsc5, as the README suggests. It sounds as if you have not fully completed the installation. After the make step, use the command “sudo make install”. After that, you can invoke nrsc5 no matter what the current directory. The README omits that important step. Thank you soo much! It finished completely! Could be I’m doing a stupid? For those having problems, note that nrsc5 is very fussy about ppm adjustment. Experimentation is necessary. For me, only ppm values between 44 and 46 work. Thanks Theori for your excellent work. Whilst it is a great piece of detective work, it has been known that the compression was a modified version of MP4 which is HE-AAC compression for a very long time. This is version 1. Version 2 used in the DAB+ versions used in Australian and Europe also include Parameter stereo which sends a mono signal along with a PS signal which steers the sound around the sound stage and only 3 kbit/s required. SBR is available in Version 1 and 2. The latest compression is xHE-AAC which has improved compression of speech signals where 12 kbit/s produces good quality speech which is used in Digital Radio Mondiale. Greater data rates are available if the FM signal is switched off to give a pure digital signal. In DAB+ countries the lowest data rate used for a single program is 32 kbit/s using SBR and PS. The digital signal is 1/25th of the FM power. This is the reason why receivers will mix the digital and analog signal on the main program as the digital error rate rises. When the digital falls over the cliff, you are listening to FM which, when the noise level is high will fade the left-right signal until it becomes mono the last event is that the FM mute operates to stop the annoying hiss heard when there is no FM signal. In Australia the main DAB+ transmitters which are a pure COFDM signal are 50 kW effective radiated power vertically polarised to match car antennas and telescopic antenna in portable radios. They typically carry 20 – 24 programs on a channel bandwidth of 1.5 MHz with the channel frequency between 174 – 230 MHz as compared to 88 – 108 MHz for your HD radio. From the same towers FM transmitters are 150 kW with horizontal and vertical polarisation. Good work guys , you only need one of the sideband/ jamming signals to get a decode , most of the stations runnign the dual sideband are only doing it to jam the smaller stations , most broadcasters and sirius/XM sounds like trash due to codec stacking . I have the same problem, but dropping the gain parameter doesn’t help. What is your successful command line for nrsc5? I might just be missing something that the developer thought was obvious. when it is working properly? If so, what sort of values do you get. I have no idea what are good or bad numbers. My problem was with the -p parameter. That value is critical. 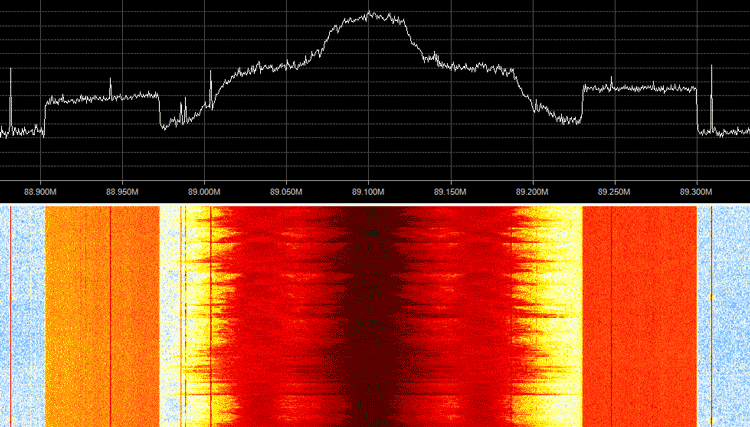 I found the right value for my RTL-SDR device through trial and error. In my area there is only one FM station that has HD sidebands. I went into gqrx and tried as hard as I could to get to the center frequency by fixing the ppm. This went a long way to getting to where I needed to be. One trick was to adjust to according to my local NOAA station by ear first, then by matching up the lines. It’s not High Definition radio and like DAB in Europe, audio quality is generally inferior to standard FM on decent equipment. As a retired Chief Engineer of several NPR Stations, this is not true. HD stands for nothing. Frequency response is 20 Hz to 20K Hz. HD does eliminate multipath due to redundant sidebands. I am stating facts. Subjective quality assessments are for you to decide. I thought it was marketing term standing for Hybrid Digital. Full digital (which I know is not legal) is said to be able to carry a 5.1 surround signal. That’s what iBiquity claimed anyway. It’s the redundant sidebands that eliminate multipath. Both of them form a channel. FWIW the mulitpath is not eliminated but DSP allows it to demod and recover the channel during multipath conditions. Channel estimation, channel prediction, add a cyclic prefix are all things that help. Any chance of posting this to github? Someone else has asked for it as well. I don’t know that I will make a github repo for scripts so simple but I told them I would clean it up and host it somewhere when I have time in the next few days. Just send me a friend request and I will let you know when it’s up. I plan on recompiling from the new branch so I don’t have to mess with gain or ppm adjustments but I will host the old scripts and add a ppm adjust for those that can’t upgrade to the new code for some reason. No, the sidebands are redundant (or so iBuiquity told us in the beginning) That’s why you can run different power levels–e.g. -14 dBc on one side, -20 dBc on the other to avoid interfering with a station on the -20 side. Both sidebands carry information and are both required to successfully decode a digital FM signal. You can view it as half of the information is in the lower sideband and the other half in the upper sideband. Because of the interleaving and convolutional coding, you would quite likely fail to decode without both sidebands. Actually you only need one side band to decode. Good to see you here, Philipp! I’ve been following your progress for the past several years, and I’m pleased to know that a mind such as yours finds value here. HD Radio can be more than what it is today, and your work is helping to prove that. Cheers! I’m hoping someone takes this and makes a gui version of this, or at least some more complaining from the software when things aren’t working. I was able to play the samples, but I’m unable to make it go live. do I need to change things so that these numbers are different? Those messages are informational and describe the sampling offset error and frequency error. They do not directly indicate an error or not. If the signal is not syncing, then you should make sure you have a fairly clean signal and the gain/ppm options are correct. Thanks, I’ve reran rtl_test -p and let it run for awhile, I initially ran it briefly, and it corrected the tuning enough for NFM. It looks like I do get output on the command line if it does tune properly. Now I just have a bunch of bad headers and CRCs but maybe I can raise the gain to help that out. It could be lack of processing resources. My 4 year old core i5 can do it just fine but it runs a core at 90%. My chromebook running Ubuntu can’t manage it. It pegs a core out at 100%. It seems nrsc5 is not multi threaded so even though I have the cores to spare, it just can’t do it. It tries though. It finds the blocks and syncs, but immediately looses sync. I’ve also noticed the signal has to be pretty strong and clean. Do the two sidebands carry different information? Wow! Well done! Easy to use and works really well. Only problem is the content. There’s nothing out there worth listening to and it’s not surprising this didn’t take off commercially. It was like when we got an SCA decoder, also cool but nothing worth listening to. On the east coast of the US, especially between NYC and DC, plenty of popular stations have fantastic secondary channels, and the primary stations sound way better than SiriusXM.